ZAC Glamour Design is an Italian Company that is based in Milan, Italy. Founded by by Andrea Colombo, ZAC Glamour Design both designs and creates unique and iconic chairs. Their luxury chairs are custom designed based on the model of vehicle chosen by each customer. The stunning Glamour Beetle Armchair is a beautiful interpretation of the iconic Volkswagen car and a baroque styled armchair. The goal of each armchair design from ZAC Glamour Design is a furnishing that combines both Baroque aspects and Auto Art. 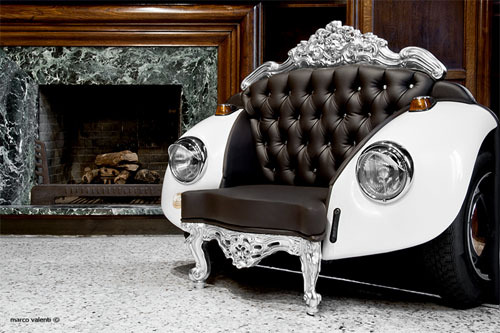 This luxury, Glamour Beetle Armchair includes real Volkswagen Beetle MY1968 wings (with LED lights) plus an upholstered chair, decorated with gorgeous Swarovski and capitonné crystals. It’s carved out of solid wood and then hand, solid finished in either gold leaf or silver leaf. Your choice of actual gold 24 kt. or actual silver. The Glamour Beetle Armchair is padded and upholstered in either leather, faux leather or fabric. The car chair’ front end features stunning scrolling French style legs, extending from the location where the grill would be typically located. To ensure authenticity, the Beetle’s headlights and chassis remain to help distinguish the actual make and model of the trendy car. If you are interested in a custom, Glamour Beetle Armchair or need help located that perfect gift for that special someone in your life, let The Life of Luxury assist you. Contact us today.